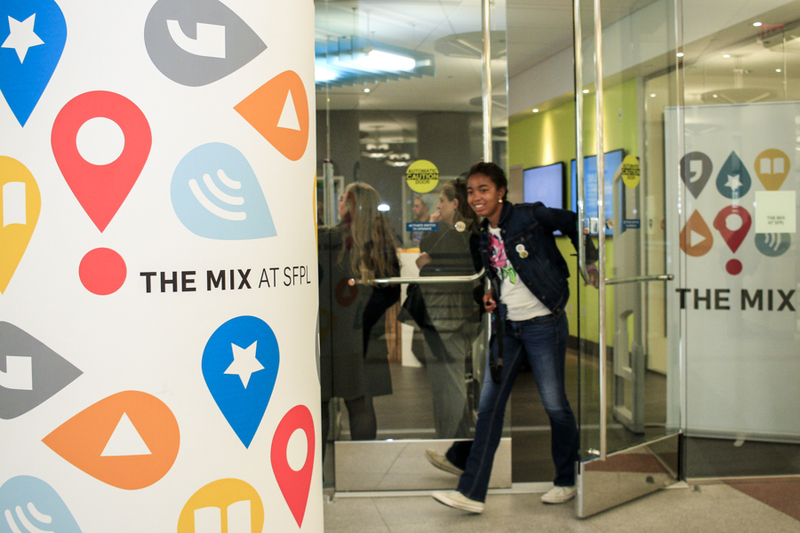 One of the latest in state-of-the-art teen centers, The Mix at the San Francisco Public Library brings together all of the spaces that teens could possibly be seeking into one designated area for ages 13–18. 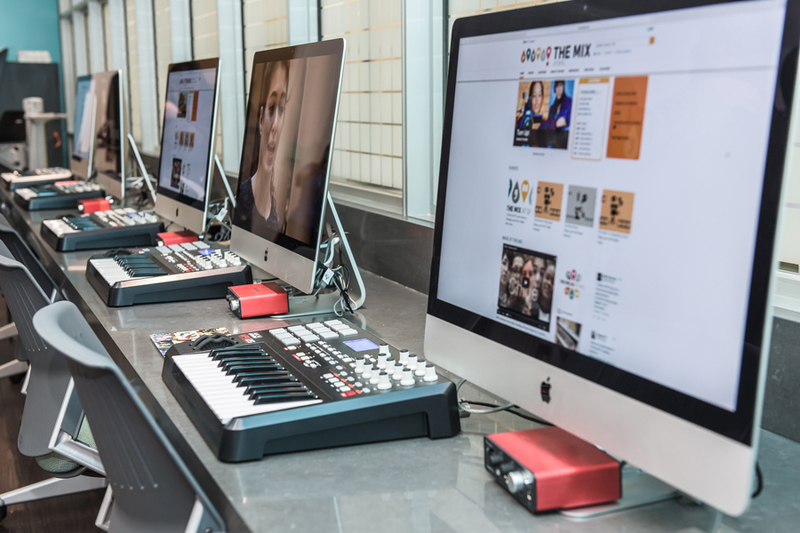 After 3 years of planning and development, The Mix held its grand opening in June 2015, just in time for the ALA Annual Conference to convene in San Francisco. 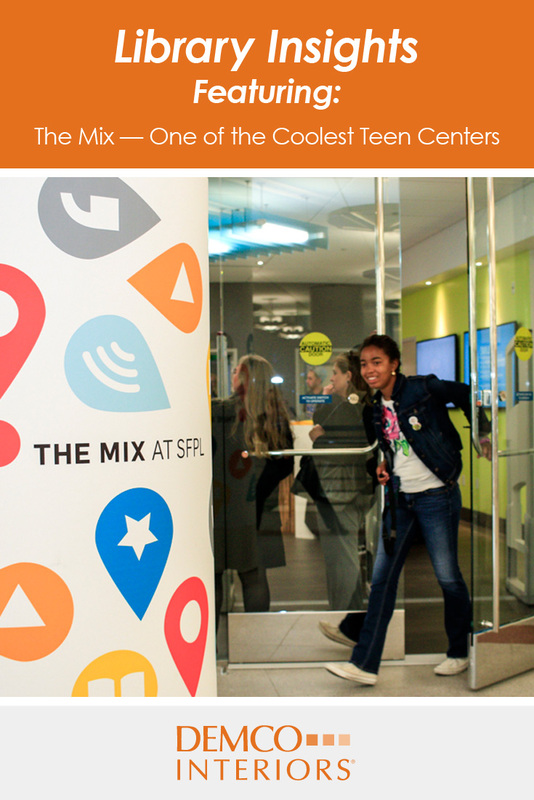 The Mix is truly a teen-inspired space, with the library’s Board of Advising Youth (BAY) actively involved in planning, programming and promoting. 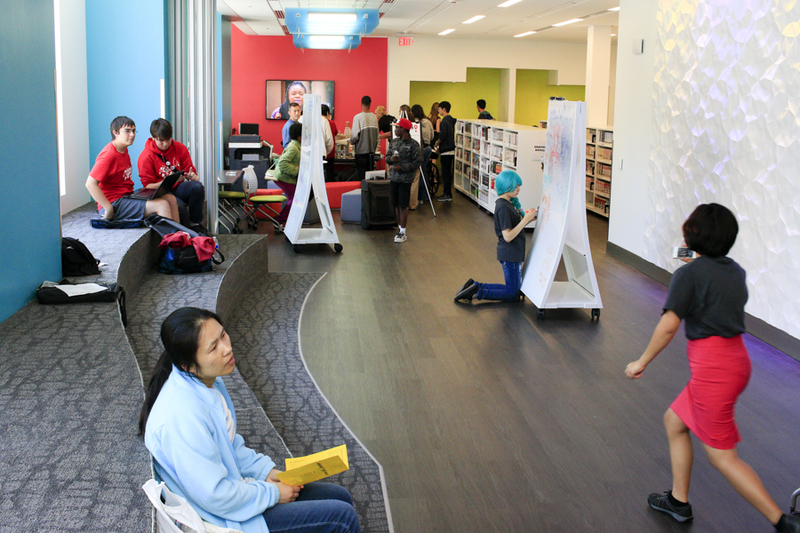 The BAY participated in the design process, and the teens’ input was included in decision-making as the space was finalized. 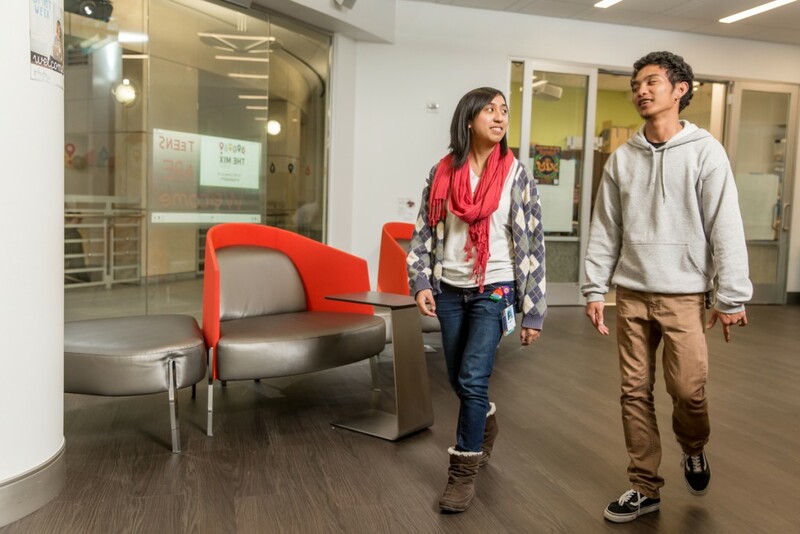 The result is a colorful and energized space that is heavily used because it meets the community’s needs as defined by the active users — in this case, the teens. 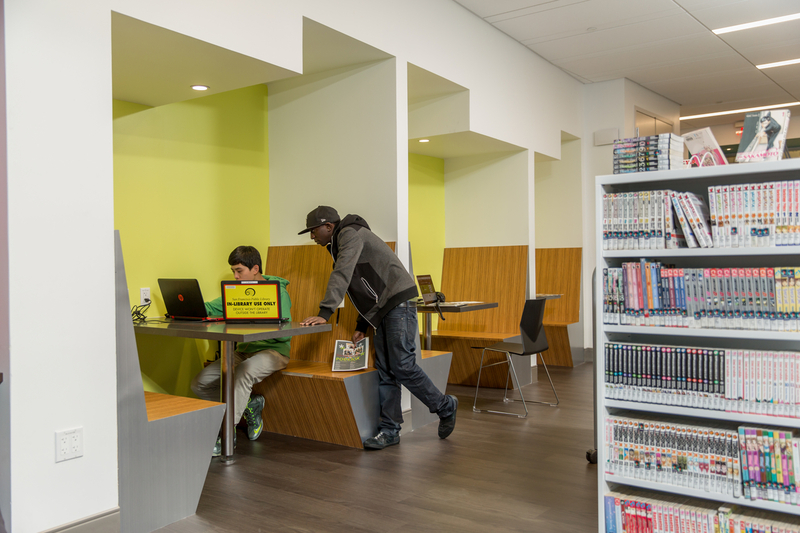 The space is also designed to support the development of 21st century skills, with opportunities to deepen learning through exploration, creation, and development of digital media and computer skills, as well as opportunities to engage with the library’s more traditional books and materials. 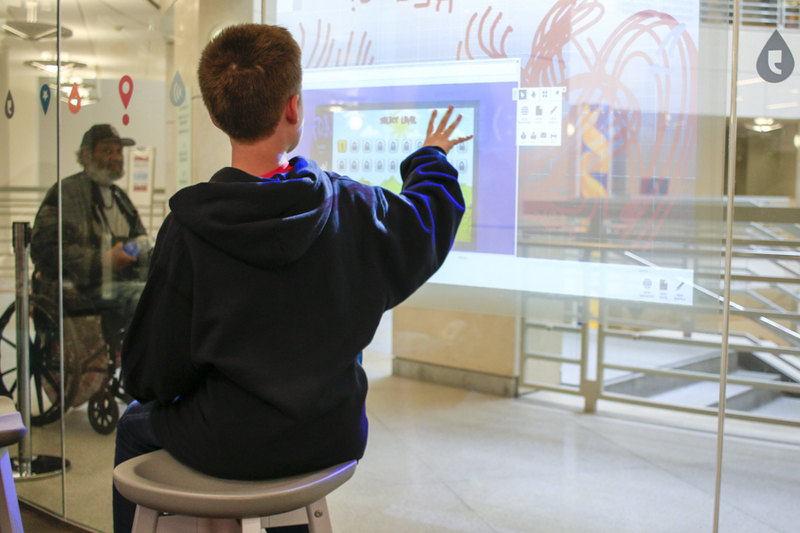 A direct response to the teens’ request, the Interactive Wall immediately engages students as they enter the space. 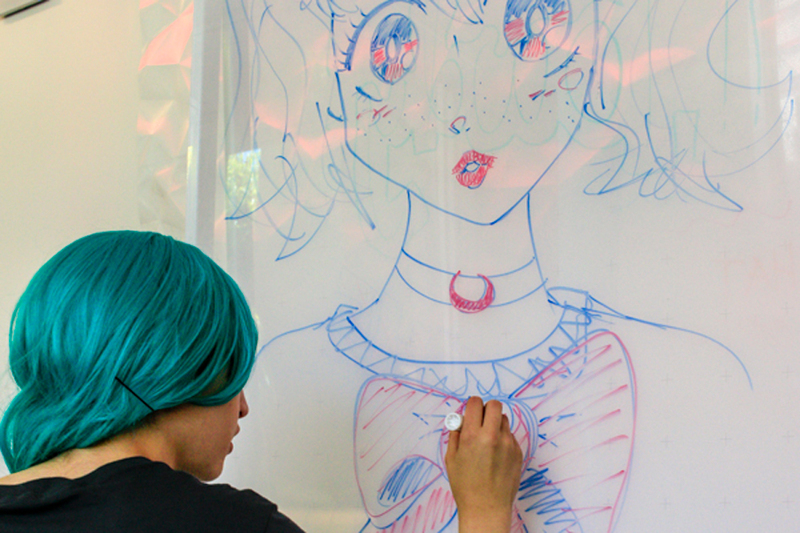 During the planning stages, the teens expressed that it would be cool to have a wall they could draw on that people could see from the outside of the space. The planning team discovered the technology they sought during a site visit to an exemplary co-working space, and planners found they could implement the same tool within The Mix using an interactive 55-inch touch-film transparent display. Separate spaces for audio and video production are centrally located and offer a wide range of professional equipment. 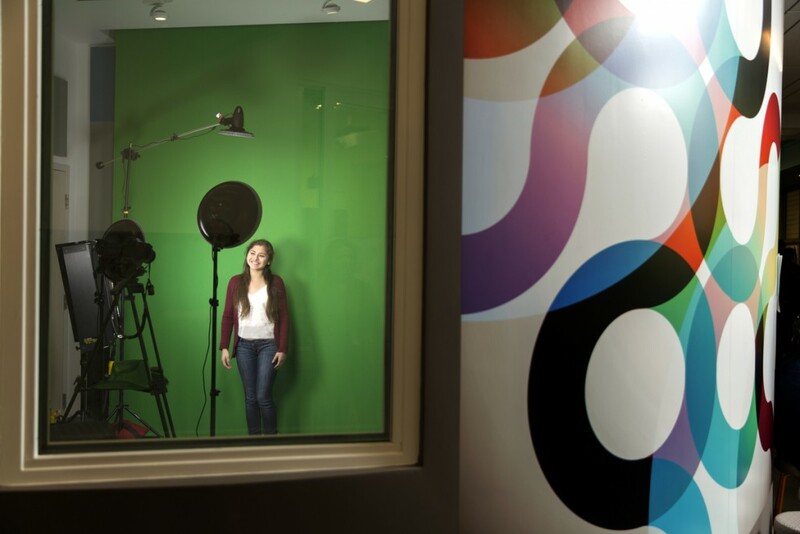 Teens can use the sound booth to record and then work on post-production at the computer stations located just outside the studios. 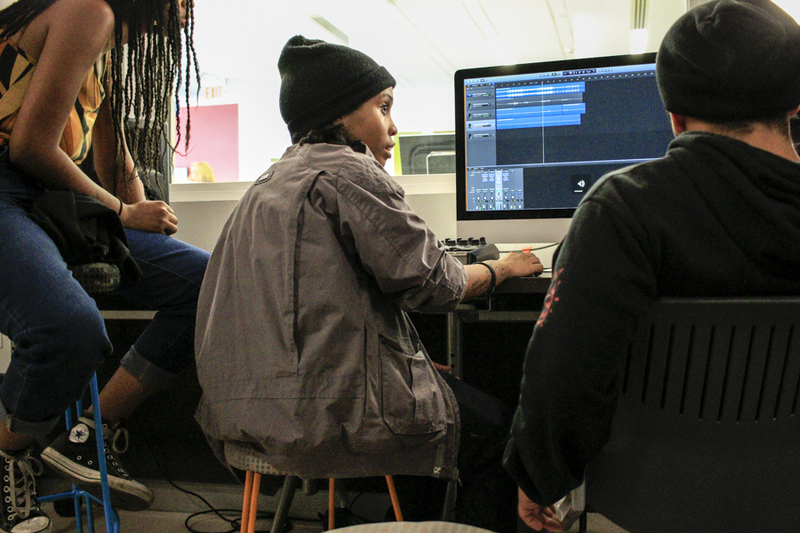 The audio studio has open recording hours and is also used as a teaching lab, with local professionals conducting training sessions. 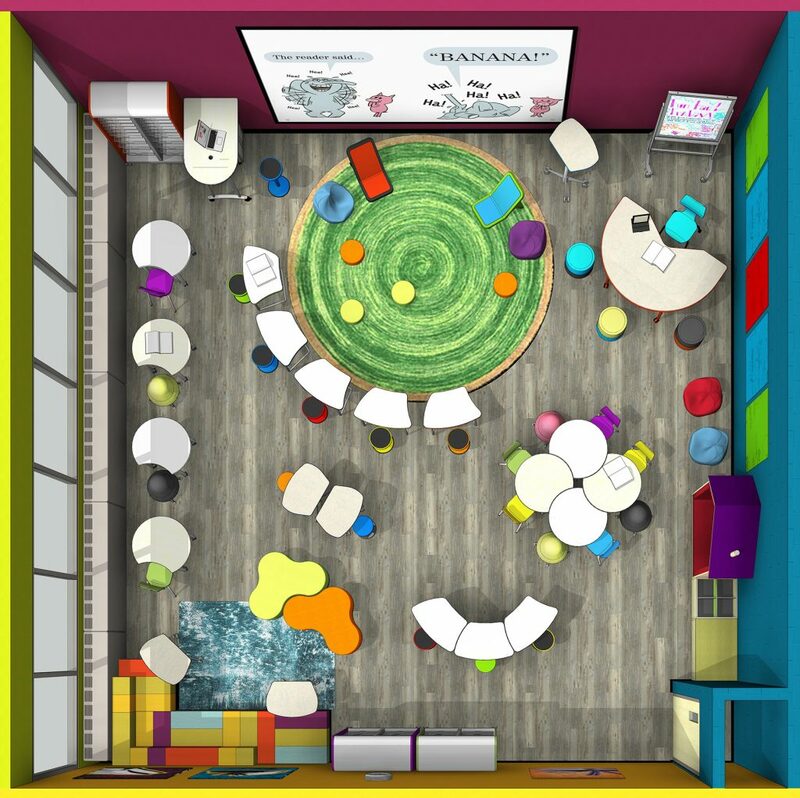 The incorporation of a makerspace encompasses a trend toward facilitating hands-on learning that is sweeping libraries of all types. The makerspace at The Mix is relatively small but became a little larger during the planning process as it took over an area that was originally intended as a café. The current space includes two standing-height tables and a lot of storage. 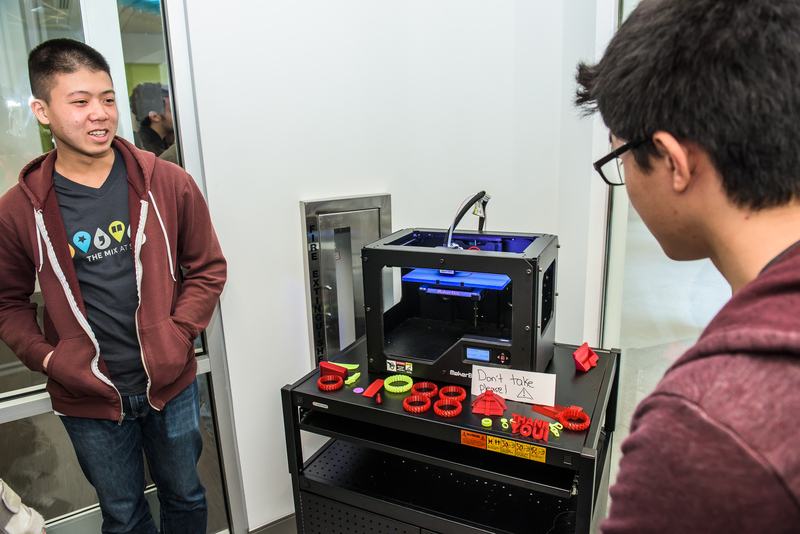 Carts are utilized for some of the equipment, such as the 3-D printer, for added flexibility. A flexible and uniquely named space, the Carpet Garden is an area where teens can just hang out. It has a relaxed vibe and is perfect for everything from socializing to performances to creating and sharing ideas on the multiple mobile whiteboards and painted whiteboard wall. 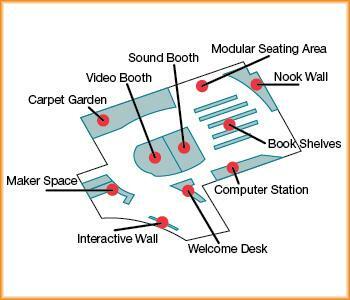 Located outside the audio and video studios, the computer stations feature specific software to build and finesse audio and video projects. The open counter utilizes a “nook” along the outside wall of the center and allows for both group and individual work, making it a convenient place to work on projects. 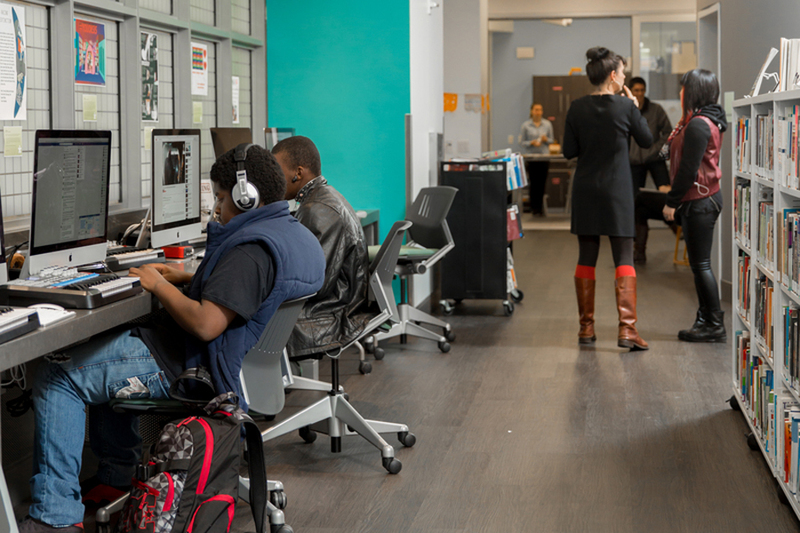 While technology and the opportunity to create gets teens through the doors, the staff still works hard to engage them with books and other materials as well. Mobile shelving units allow staff the flexibility to experiment with the location of the collection and to move things as needed for larger programs. The seating area includes modular tables that can easily be reconfigured for different needs. 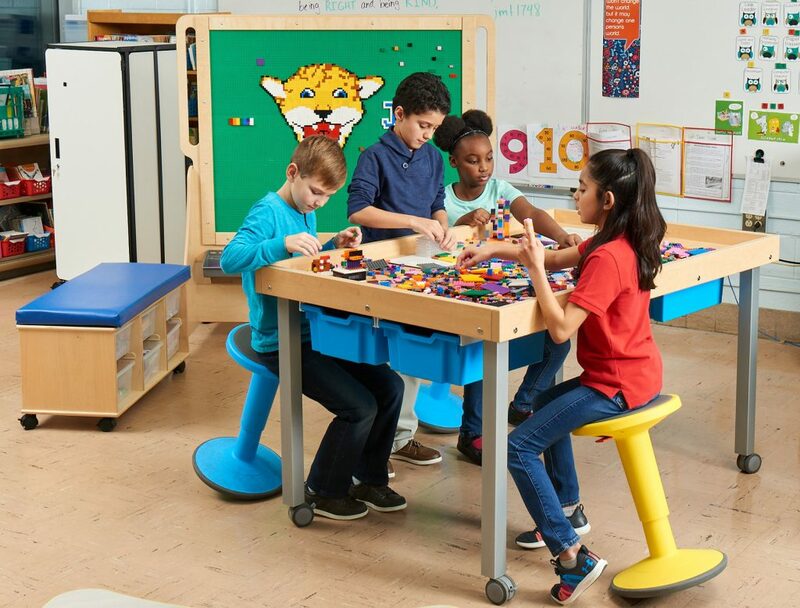 The built-in booths are perfect for independent work and can also accommodate small groups for collaborative work. 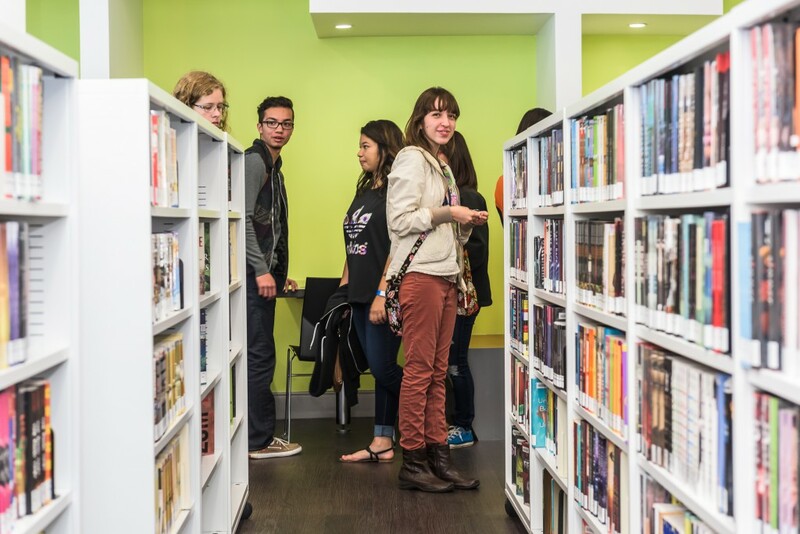 The San Francisco Public Library has made a commitment to their youth through The Mix and is seeing impressive returns. 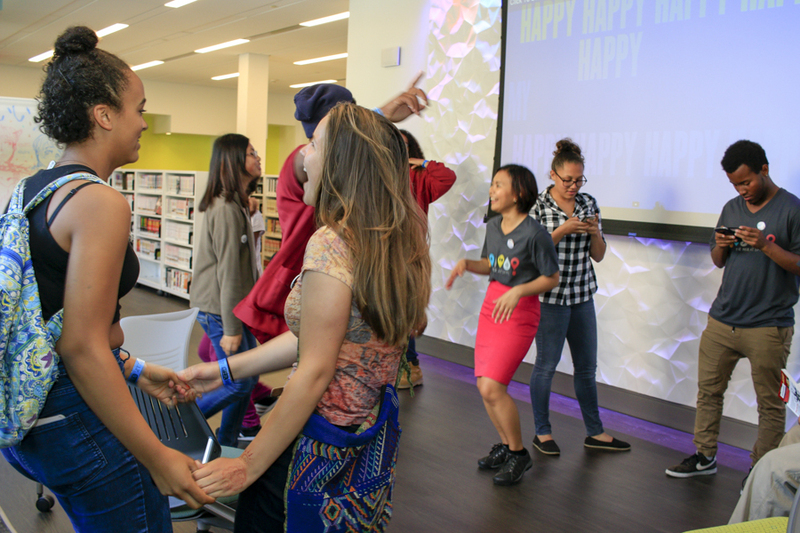 The library’s Board of Advising Youth assists with teen program design and even acts as assistants for outreach events involving children and teens. What started as a youth-driven design project has created a highly engaged population that continues to drive programs and be involved in library and community activities.